Having troubles sleeping at night? Has it been forever since you woke up rested from a good night sleep? That evil cycle of not being able to sleep properly at night, falling asleep late and waking up early in the need to go to work it’s awful. You are having lots of troubles getting up and alarm is your worst enemy, right? In our teens, we can get by with sleepless nights once in awhile, though they are usually caused by partying and not insomnia, but as we mature, both our body and our lifestyle and duties change and a good night’s sleep is essential. In my early 30’s I can’t have a bad night’s sleep, I simply can’t afford it. It’s costs me a day of where I get nothing done and I’ll be cranky and unmotivated. Sleep is a big factor on of how my day is going to be – as I think is for most of us. Sleep helps you brain function properly, preparing you for the next day. A good night’s sleep improves learning: whether you are studying at school or learning something new at work, you will be more focused when you’ve had a good night sleep. A period with sleep problems can have an impact over your emotions, behavior, decisions, can even make you feel depressed. Sleep is also an important factor for our health, it helps the healing and repairing of heart and blood vessels and it helps maintaining a healthy balance of the hormones that make you feel hungry or full. Not getting enough sleep will make you less productive at work or school, people who don’t get enough sleep take longer to finish a task and make more mistakes. I used to have periods with several nights in a row when I just couldn’t sleep. I was tired but my brain just didn’t want to stop thinking and worrying. The more I thought about something, the worse it would get in my head. After many hours of tossing and turning, when I would finally fall asleep, those thoughts would affect my dreams and I woke up feeling restless, tired and not in the mood for anything. Lucky for me, in time I found ways that helped me improve my sleep and managed to get those thoughts out of my head and although I don’t always have good dreams, it’s been a really long time since I woke up with the feeling of a bad night’s sleep. The first thing I do to prepare for a good night’s sleep is air out the bedroom. I do this about an hour before bedtime and repeat it in the morning. Our apartment is quite small, so if we cook, the smell tends to get into the bedroom also. According to Huffingtonpost.com fresh air before going to bed helps oxygenate your brain and it busts stress and increases happiness. If your workplace is anything like mine used to be, a busy environment where you stay on your feets all the time or you work in an office, 8 hours a day staring at the screen you might be exhausted and not in the mood for anything when you are finally off – understandable! But a 20 minutes walk outside or a half an hour forced run will really improve your feeling of tiredness, it will help you unwind and clear your mind of work. Try to have a light dinner. I used to come home starving and since I love fast food and all the greasy foods, I would eat a lot and then just feel bad, tired in my stomach and bloated from all those empty calories. Now my dinners can still be be big but I try to have the majority be vegetables for almost all my meals. I don’t remember the last time I did not have vegetables on my plate for dinner. Since I eat many small meals during the day, I don’t feel so hungry at night and I go to sleep with a lighter stomach. Creating a cozy atmosphere while cooking and eating is so important to me. I always have candles burning in all the rooms of my apartment (it’s just two + the bathroom to be clear haha) and I like listening to a little bit of jazz. You see it in movie all the time and I love doing it also. I used to also drink a glass of red wine here and there but I try to cut down my wine intake as much as possible, especially before bed. A common reason people can’t sleep at night is stress. And stress comes in many different ways, work, personal life and so on. I’ve only experienced work stress so far, so that’s why I associate everything with that. Doing what I love now has changed my life. I have things to do, I might still stress about some stuff but it’s still different. I go to sleep and I say to myself, good things will happen to me, I know. Instead of having bad thoughts and experiences from the day rolling around in my head, I choose to dream. That’s right! I dream about many things that I want to happen to me in the future and if I don’t dream then I try to visualise a peaceful place – a beach for me and focus on how relaxed that place makes me feel. I avoid watching movies too late, especially scary ones or movies that gets the adrenaline pumping. Before bed I like shows that are a bit funny, make me laugh and doesn’t require too much deep thinking. Of course a book is the best remedy for a good night’s sleep if movies or shows are not something you usually do. 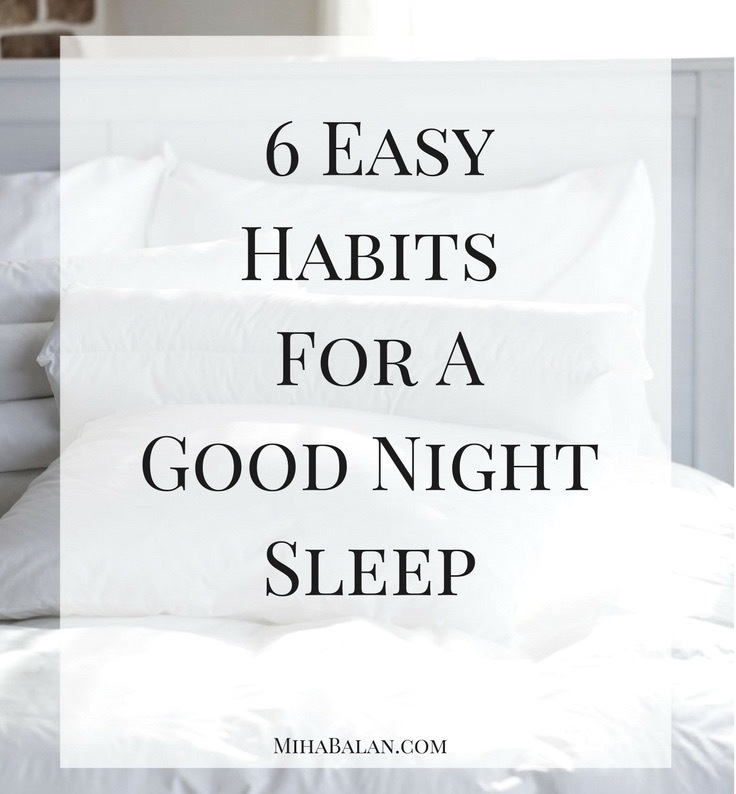 These habits have worked for me and I am hoping that they will work for you too as I can totally understand how hard it is when you don’t get good night sleep. Since last year I did my best to change everything that I felt was unhealthy for me and for my life. This is the lifestyle that I adopted and works for me. It takes time to find the right way for a positive lifestyle change because everyone is different and has different challenges to face. Are any of these small ideas is something you are already doing? If not, would you consider adapting them in your daily routine? Next Post Are you in a healthy loving relationship?